NEW YORK CITY, NY — Special Olympics New York President & CEO Stacey Hengsterman today announced that Special Olympics New York Athlete Charlie Kleiman, of New York City, will be racing in the 5th annual Unified Dual Slalom Competition at X Games in Aspen, Colorado this week. 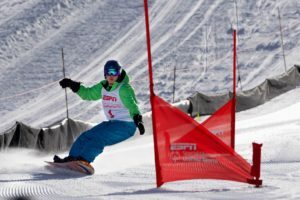 Kleiman will be paired with Professional Snowboarder Jack Mitrani, of Long Island. The Special Olympics Unified Sports program promotes an inclusive sports community by bringing athletes with and without an intellectual disability together to compete on the same team. Special Olympics athletes from across the country will be paired with professional action sport athletes, comprising of a total of ten, two-person teams for Thursday’s event. Each of the team members will participate in one run on each out of two competition courses; the professional athletes racing against one another and the Special Olympics athletes racing one another. The winner will be determined by the best combined times of each team. Special Olympics New York partners with nearly 150 schools across New York to offer unified sports. More than 8,000 students with and without intellectual disabilities currently participate statewide. Additional information on New York’s programs can be found online.